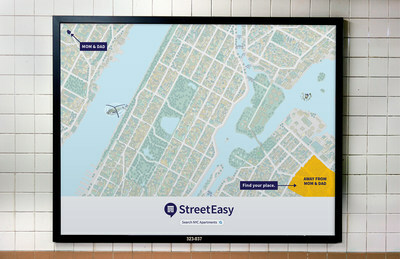 NEW YORK, Feb. 21, 2018 /PRNewswire/ -- StreetEasy®, New York City's leading real estate marketplace, debuted its fourth out-of-home advertising campaign this week, the latest evolution in a series titled "Find Your Place." The year-long campaign will be featured in subway stations, train cars, sidewalk kiosks, buses and taxi tops throughout NYC. The campaign depicts the home search through Venn diagrams laid over map-based illustrations of the city to show the ways New Yorkers think about their ideal location. These diagrams showcase genuine aspects of life in NYC, such as the neighborhoods where work and play happen, and the spots where friends and family gather. Whether the search considers how far to live from Mom and Dad, or where one is most likely to encounter co-workers on the weekend, NYC home shoppers will recognize themselves and their searches in each illustration. "Being hyper-focused on NYC real estate, we understand the intricacies that make this market a unique place to find a home, and we translate those into city-specific platform features and filters that can't be found anywhere else. This vantage point enables our advertising campaigns to embody the same NYC authenticity," said Susan Daimler, general manager of StreetEasy. "This year's campaign goes a step further than what we've done in the past and highlights the mix of serious and sometimes-funny considerations that go into a NYC home search." Similar to previous ads, StreetEasy's 2018 campaign features an array of illustrations, each juxtaposing relatable copy with vivid, map-like drawings of NYC streets, corners and buildings. StreetEasy worked with independent creative agency Office of Baby for this campaign, a partnership that dates back to StreetEasy's debut ad campaign in 2015. "The illustrations had to be extremely accurate — we're talking about real NYC places that New Yorkers know down to the blocks," said Paul Caiozzo, Office of Baby's founder and chief creative officer. "There are a lot of unique executions, and we like to customize the creative for each placement. If it's an area where people are stuck, we like to give them something to read. If it's a high-traffic area, we keep the copy brief, so we made sure every element fits contextually." StreetEasy's previous campaigns include 2017's "Find Your Place," 2016's "Find Your Formula" and the company's 2015 debut, "Live As You Please." StreetEasy is New York City's leading local real estate marketplace on mobile and the web, providing accurate and comprehensive for-sale and for-rent listings from hundreds of real estate brokerages throughout New York City and the major NYC metropolitan area. StreetEasy adds layers of proprietary data and useful search tools to help home shoppers and real estate professionals navigate the complex real estate markets within the five boroughs of New York City, as well as Northern New Jersey.